Most people , when they think of Vienna (and I mean Vienna in Austria/Europe, not in the USA), they think about Mozart, about the Spanish riding school, about Chocolates(yummy…) and many other attractions of Culture and Classic music. But, who would associate Vienna with whisky ?Well, in the capital of Austria in the center of Europe, a small but active community of whisky Connocieurs and whisky lovers has been developing in the last years. Center of development was and is the legendary Viennese Whisky shop “Postill” in the center of the city. The shop started importing Single Malts, in the early 90’s, at a time when (in Austria at least) whisky was a synonym mostly for Blend’s or Bourbon. From the early 90’s till now many things happened in the world and in the Austrian whisky community. The first big step towards bringing Single Malts to a broader Austrian audience, was the 1’st Vienna whisky fair, in April 2003 at the Hotel Wimberger. It was a experiment, that showed, that many people in Austria are interested in single malts and whisky in general. 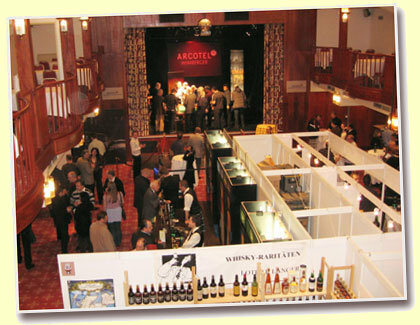 The big success of the 1st whisky fair made it possible to regularly organize a whisky fair in Vienna every 2 years since then, in April 2005, April 2007 and March 2009. Vienna is also known for its “comfortable ambience”, this part of the fair is represented by the Whisky Club of Austria. The club is present as a exhibitor since the second whisky fair (April 2005), with one of the biggest stands in the fair at the 1st floor. The stand is decorated like a “English gentleman club” which is used as a relaxing “oasis” mostly for local politicians and VIP visitors, like the British Ambassador and the Irish Ambassador in Vienna. I was impressed from the new Kilkerran, because when I first tasted it in Campeltown with Serge and Olivier (on our way to the Islay festival 2007) it was (sorry) not drinkable, chemistry pure, like a paint diluter….this new Kilkerran is really good, with big potential and the same goes for the Hazelburn too, for me the best Hazelburn I tasted till now ! One stand next to Springbank was Glenfarclas, hosted by Ian MacWilliam. I met Ian many times, in Scotland and in various European Whisky fairs and he always had either great samples or bottlings with him. 90 Glenfarclas 1954/2000 (43%, OB, 1193 Bts., Dd:06.54/07.00) 2000 OB, he brought with for a Master Class. I sampled a 83 Rosebank 25yo 1981/2006 (61.4%, OB, 4710 Bts.) 2006 OB, knowing all the other bottling there and seeing how busy the stand was, I moved further to the only exhibitor representing the “Rarities” fraction, Lothar Langer. Lothar who attends the Vienna whisky fair since the beginning, had again a stand, full of long gone bottles for tasting and selling. Good old stuff, where I mostly took samples for scoring the later. Among the sampling, I couldn’t resist to have a dram of the 92 Ardbeg 24yo 1965 (54.4%, Cadenhead’s for Sestante, Dumpy white label, 75cl) c1989 Cad, which I already scored, but…. it was the only old Ardbeg in the fair and a good one too. Lacking of time I moved furher and payed only a short visit to the Bruichladdich/ Murray McDavid stand and Barbara McEwan where I had a 87 Octomore 05yo ‘Edition 01.1’ (63.5%, OB, Bourbon, 6000 Bts., 2008) 2008OB. Even, if time had passed, I couldn’t miss to pay a short visit to the biggest attraction of the fair, the Chivas Stand with a Roulette table and of course the Chivas Girls. The amount of visitors is increasing steadily since the first fair in 2003 and it is a mixture of all ages, the older more experienced ones, among them many younger enthusiast and many young female visitors ! (Who said that whisky is a man’s Domain ?) Very interesting was the fact that the most girls and woman’s that came to our stand for a dram preferred the peaty, smoky stuff with a higher ABV ! The number of exhibitors and visitors, shows that Austria, even if not a big Whisky Market in means of sales, it is taken seriously from the whisky industry and it has potential to grow further.